At Media Day, it seemed like every other question asked of the players was about high expectations for this season. With 15 returning starters from a 9-win team, that didn’t come as much of a surprise. There wasn’t much we didn’t know about the Navy team back then. There certainly was on Saturday, though, with Tago Smith replacing an injured Keenan Reynolds at quarterback against Texas State. Now there was an element of the unknown. How would Navy react to its new signal caller? How well would Tago direct the offense? Pretty well, as it turns out. The Mids rumbled for 352 yards on the ground on the way to a 35-21 win in front of the second-largest crowd in Texas State history. Noah Copeland led the way with 116 yards, followed by Smith, who added 85 yards and 2 touchdowns. The sophomore quarterback also threw for 117 yards and 2 more TDs on 5 for 7 passing (with an interception). It was Navy’s 9th-straight game of 300+ rushing yards, and the Mids improved their record to 2-1 heading into this weekend’s NMCMS opener against Rutgers. As it became more and more apparent that Tago would be getting the start, my concern for the game was that Coach Jasper wouldn’t be able to run the full offense with an inexperienced quarterback. Against a defensive coordinator that has had some success against the option in the past, that could mean trouble. As it turns out, Navy was able to run everything it needed to adjust to the Texas State game plan. Again, like Temple, the alignment didn’t really matter unless they shifted to something that gave up a numbers advantage. More important than the way they lined up was what they were doing after the snap. This means there are three defenders out of the secondary, but only two guys blocking them. Depending on what the defense is doing with their linebackers, you could have the PST block one of the safeties, but that would potentially leave one of the linebackers unaccounted for. 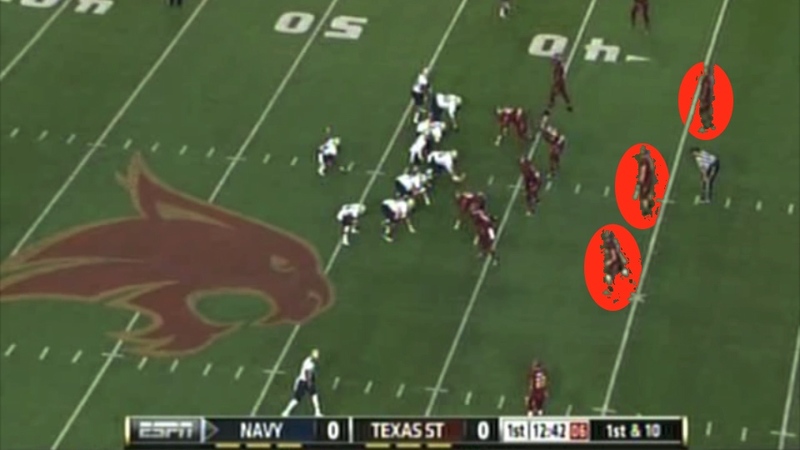 Navy’s heavy use of the midline is why the QB and FBs got 50 of Navy’s 57 carries. So, what are the takeaways from the offense in this game? First and foremost, Tago played very well. Not perfectly, but well enough that we can feel pretty confident in the offense with him at the helm. The Bobcats were very aggressive in using their secondary to put pressure on the quarterback. Tago responded well. 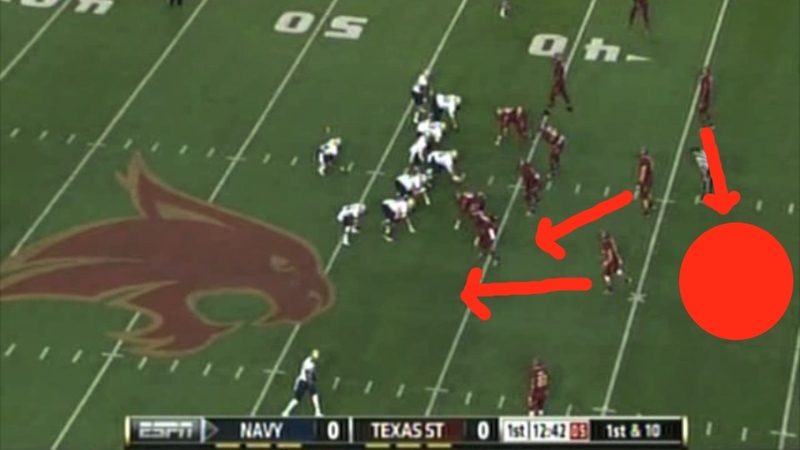 This also wasn’t a limited version of the Navy offense either; it’s unlikely that the offense would have looked any different in this game with Keenan at the controls based on what Texas State was doing. If the concern before the game was that Coach Jasper wouldn’t be able to make the adjustments he’d want to make with Tago under center, that proved not to be the case. Before you get too crazy with the “Tago is the next Staubach” talk, there’s still a lot we don’t know. Texas State didn’t really try to confuse Tago read-wise, so it’s hard to say how he’d react to some of the more complicated stunts some defenses use. We also don’t know how comfortable the coaches are with Tago making calls at the line of scrimmage. His passing could probably use a little work, too. While he made a couple of decent throws, it appears that Tago’s arm only goes one speed. Not every pass has to be a frozen rope, and with a little bit of touch on his throw, his interception might have been a TD instead. That’s something that can and will be worked on, and will improve over time. Overall, though, the most important thing is that we didn’t see anything that would make us think that Tago won’t be a fine option quarterback. The other irksome thing about the second half came on 4th and goal on the first drive. The coaches decided to try a sneak on a quick count, which I never like. I get the idea; if the defense doesn’t have a chance to set and dig in its heels, they’ll be easier to blow off the ball to gain a yard. The reason I don’t like it is that Navy’s offense relies more on technique than brute force. Hurrying up to run a play like that takes the offensive line out of their element. I would rather they take their time, set up, and run a play. It’s a judgment call, and admittedly one a lot easier to make with the benefit of hindsight. Defensively, it was a bit of a mixed bag. On one hand, Texas State could only muster one scoring drive through three quarters, and were held to only 5 of 15 on 3rd down conversions. Defenders did a good job getting into passing lanes too, batting balls down and grabbing an interception. On the other hand, with 11 penalties, Texas State did a lot to stop themselves. The Bobcats had a golden opportunity to tie the game at 7 on their second drive, driving all the way to the Navy 6 yard line. A series of penalties, including a delay of game penalty on the Texas State sideline, drove them all the way back to the 42. The Bobcats were able to get back to the 15, but the ensuing field goal attempt was no good. Had they been able to punch it in there, who knows how the game would have gone. It seemed like that whole sequence really took Texas State out of their element, and they never really got back on track until it was too late. The biggest problem on defense was that tackling was very poor. I’m not sure what it is about playing up-tempo teams, but for some reason it tends to make the Navy defense play a little more on the reckless side. Guys were overrunning ballcarriers and got caught out of position a lot. At least, I think the tempo played a big part in that. It’s the only explanation I have, because that hadn’t been an issue with the defense before Saturday. Fortunately, with the exception of maybe Western Kentucky, I don’t think anyone left on the schedule is quite as aggressive in getting the play off as quickly as Texas State. Ultimately, despite the issues on both sides of the ball, this was a good win. I don’t know if Texas State will be any good, but any time you come out with a 2-TD win on the road with your backup quarterback, you have to feel good. The next three weeks are an important stretch for the Mids, so it’s good to have a little bit of momentum on their side. Thanks, Mike. You answered a lot of questions that I had in my mind. One note: The first video isn’t working. But I recall watching that during the game, so I know of what you were referring to! Video works for me. Hopefully you just experienced a temporary glitch. Well done as always. Agree that Texas State’s meltdown on first drive propelled Navy to its large lead. It’s hard to win at any level with 100+ yards in penalties. Must say that Rutgers makes me nervous. They have done a good job of defensing Navy over the years. Hoping that friendly surroundings of NMCMS will provide the Mids some extra juice. Mike, agree the QB keeper at the goal line pits one of our weaknesses against bigger teams’ strength. Perhaps it is offset by no handoff or lateral minimizing turnovers. It does make me cringe to see some of the spots Keenan has taken at the goal line on the keeper. Thanks for this weeks tapes. It’s not the QB keeper I talked about. It’s hurrying up to run the play. As I recall, on the one TD, TXST was still getting about 5 of their players onto the field. So we were trying to score against half of a defense. With a penalty (half the distance from the 1) in our back pocket. So I agree with that attempt. The other one? meh. Your reference to the “Western Kentucky defense” caught my eye. I’m sure this was not the first time a team that is facing the TO looks to another team that has beaten us and then tries to duplicate their defense. They overlook other elements to the game (QB knocked out) and, more importantly, the fact that our very experienced coaching staff knows how to make adjustments to defenses they’ve seen in the past (and has “seen it all”). Of course, the players then have to execute, and this year they seem to be doing an excellent job. Thanks again for showing us the details of those adjustments. It’s a pleasure reading your posts. Disagree with giving Al Groh an A. I thought he was terrible. Called Texas State Georgia State and Texas Tech. Many times in the first half he predicted what Navy would do on the next play and was wrong every time. Maybe that’s why he stopped predicting! If that’s the stuff you care about, then we care about very different things.